This is in the Stübaital in the Tyrol in Austria. Get to Innsbrück first. You can either fly to Innsbrück Airport or train from West or East, e.g. Zürich (Eurostar + Lyria TGV via Paris from London) or Salzburg. Bus or walk to the railway station if you fly & take another bus to Neustift. All of this site is on Kompass map 83 'Stubaier Alpen, Serleskamm'. Alternatively, you can walk in from Innsbrück by the route in my Stübai trip on this link. ...you need somewhere to stay. I have stayed in the Hotel Volderauer, which is 'simple' but was closed in 1992 & the Angelika, which is posher but still, not very expensive. There are other hotel options. I have done all these walks myself. For wintry types, there is some skiing, both outside the village in a steep black run from the Elferspitze chairlift & up the valley by the Dresdner Hut. But also, see the first walk! Note:- all these photos were taken within four days - 6th to 9th September 1976, which shows how changeable Alpine weather can be. 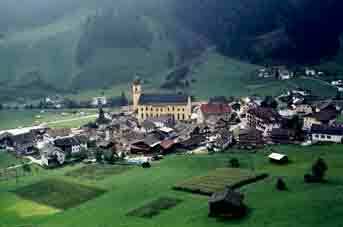 Neustift from the Autenalm path. Two roads leading NW from the village meet up where the path comes down from my Stübai trip. Don't go up that one! 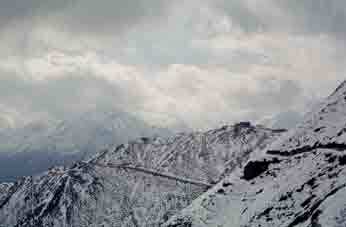 Turn left towards the Karthallhof (path 131) & follow it as it curls round & up the Mahder Berg. 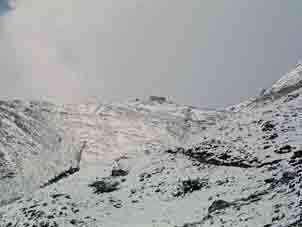 It follows the ridge up to the hut, 2229m. Have a well-earned lunch. Leave East on path 115 but do not be tempted down it back to Neustift yet. Go round to the Sennes Joch. Follow path 114 down into the beautiful Schlicker Alm underneath the spectacular Kalkkogel ridge. This is Austria's secret ski area. Carry right down to Fulpmes & follow path 131 back to Neustift. The Starkenberger Hut on the way up. 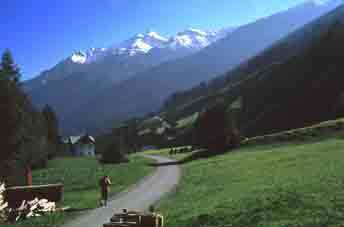 The path to the Sennesjoch. A dramatic-looking hill. While not what I call an 'alpine trip', take a rope. There is time in a day to walk up but use the chairlift to avoid walking up what Mark Heller describes as the most horrendous artificial ski run in Austria. 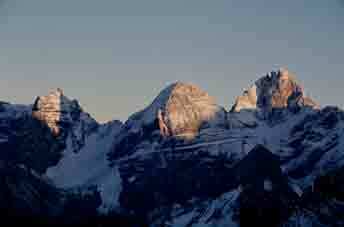 Then, follow the ridge uo to the dolomitic summit. This is a scramble with fixed wire ropes, some not reliably fixed in 1976, so test each one before using. The summit is tiny, hardly enough to sit on (see below! ), with its usual cross strapped to it with wire. 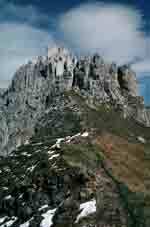 Carry on SW to the Zwolfer Nieder pass through the spiky dolomite. We had to abseil off at one point. Take the path down (left on last photo) to the NW via the Autenalm café & down to Neustift. 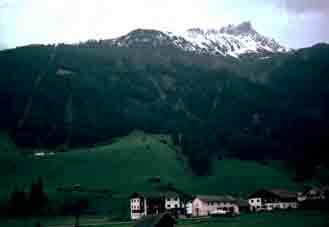 Elferspitze from the village. Chairlift to left. 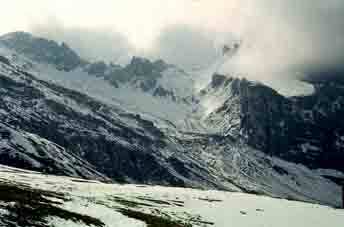 The route follows the skyline. 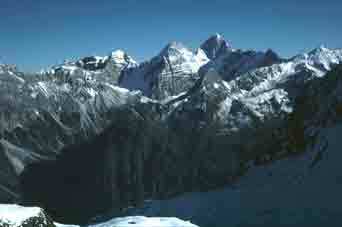 Habicht from the Elferspitze traverse. The Elferspitze from the Zwolfer with me & Jane. Cross the bridge over the Ruetzbach & turn left (NE) to Herrengasse. 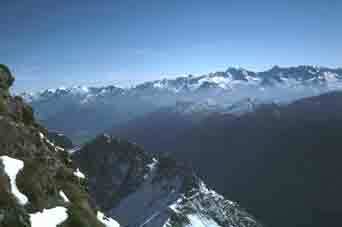 Turn SE into the Pinnistal, a pretty valley with a fine view of Habicht 3277m ahead. The valley narrows & the path climbs up the East side, possibly through snow, to the Pinnisjoch, where sits the hut, 2369m & suddenly, a spectacular view across the Gschnitztal opens up to the Tribulaun dolomite peaks. This is a long walk & might want to stay in the hut. If so, you will see glorious changing colours on the peaks opposite. The Tribulaun in the sunset. This hut is the starting point for the Habicht climb but we were defeated by nasty, unstable snow in 1976 & only got halfway up this easy scramble. Tuxeralpen (East) from half-way up Habicht. Note, left, the type of scrambling involved. IDEA. It would appear to be a pleasant trip to go up the Oberbergtal to the Franz Senn Hut, stay, then cross the traverse path (600m of 'up') to the Neu Regensberger Hut & down to the valley for the bus back to Neustift but I have not done this (yet). 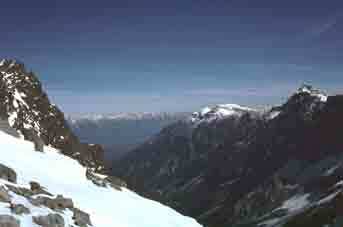 When I was in the Neu Regensberger Hut in 1992, some people had taken all day on the traverse & stayed the night. 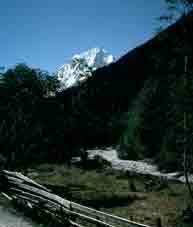 URL: http://www.art-science.com/Ken/Alpine/Neustift/index.html Last revised 1/6/2012 ©1998-2012 Ken Baldry. All rights reserved.